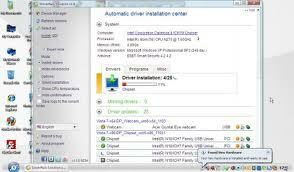 This article is an update of my previous article, namely DriverPack 11 - Collection of drivers for Windows. Solution 8.11 DriverPack DriverPack Solution is the latest version for the moment, there are many additional features and database drivers, but I do not know its details, I find no information on the web. It DriverPack Solution is a program that contains a collection-a collection of drivers (automated driver installation) for all versions of Windows (32/64 bit) that you can use in a wide range of computers. INFO: If you are plagued Internet connection to download it, I provide the facility / option orders, please click here. Anda sedang membaca artikel tentang DriverPack Solution 11.8 dan anda bisa menemukan artikel DriverPack Solution 11.8 ini dengan url http://scbarqah.blogspot.com/2011/11/driverpack-solution-118.html,anda boleh menyebar luaskannya atau mengcopy paste-nya jika artikel DriverPack Solution 11.8 ini sangat bermanfaat bagi teman-teman anda,namun jangan lupa untuk meletakkan link DriverPack Solution 11.8 sebagai sumbernya.